There was a small birthday party at the house the other day. Amid the whirlwind of people leaving—with kids scrambling for shoes and jackets beneath remnants of tissue paper and toys scattered everywhere—a bear was left behind. I didn’t know a bear was hibernating here until I was tossing plastic cookware into the little wooden cupboard and uncovered the creature sleeping under a green apron. The owner identified her 3-year-old self and relayed a message through her mother asking if Teddy was OK. I said the bear was fine and snapped a picture of Teddy laid out on the kitchen table. In retrospect, I can see that the picture may have been somewhat unsettling, a bit stark perhaps if not downright cold. It may even had the hint of Teddy being prepped for surgery. I could hardly say getting ready for a hernia repair, so I quickly staged a picture of Teddy to put her little mind at ease. One of the kids had stormed the house with helium balloons announcing, “You can’t hab a potty wifout bawoons!” I tethered the balloons to the bear and sent a picture saying Teddy was having fun on my desk, hoping that was the end of it for the time being. I probably wasn’t as sympathetic to the trauma of leaving Teddy behind as I should have been. I never had a blankie or toy I held onto as a kid at bedtime, nor did any of our children. But our grandchildren do. Their cuddle artifacts of choice range from plush toys to dolls, blankets with fringed edges, worn burp cloths, locust shells in a small box and a red metal tractor. Sometimes there are so many toys, blankets and oddities in the bed there is barely room for the child. the right, Teddy’s eyes moved right. If I leaned to the left, his eyes moved to the left. Teddy was the Mona Lisa of bears. Teddy followed my moves as I passed in and out of the room throughout the evening, glaring sometimes, casting a “just you wait and see” look at others. When I closed down for the night, I gave Teddy one last glance. His smile had turned to a smirk. The next morning all the balloons that Teddy had been holding were on the ground. There weren’t any puncture marks, but I had my suspicions. 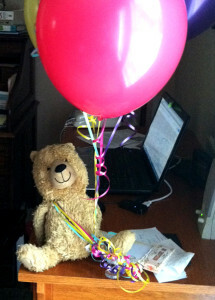 I received an early call asking if Teddy was still having fun with the balloons. I explain the balloons had mysteriously deflated in the night. There was an audible gasp, followed by the silence of disappointment. Teddy looked straight ahead and avoided eye contact. Fine. You win, bear. I’ll take you home today.